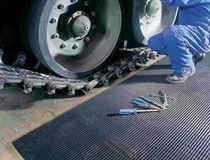 Heavy duty rubber mat, a scaled down version of our industrial matting. Slip-resistant, open construction rubber mats for drainage and maximum dirt control. Studded underside to keep it from moving when loose laid outside or in. Ideal for removal of mud, dirt and other debris. Easy to clean – just hose off. Suitable for all building entrances - indoor and outdoor. Ideal for gardeners, parents of boys and muddy sports enthusiasts. 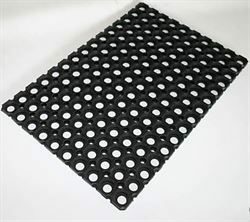 These are top quality mats that will look great year after year whatever the weather.